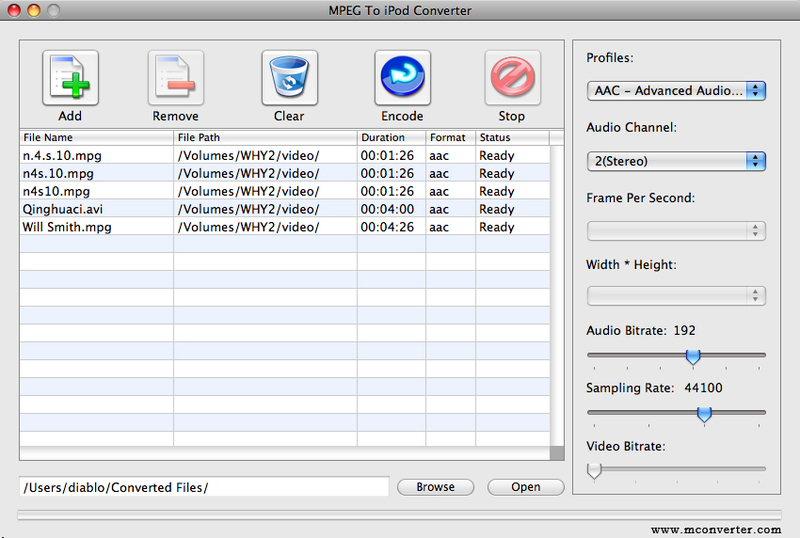 MPEG To iPod Converter for MAC is powerful MPEG iPod converter software for your iPod player, It which can converting MPEG-1, MPEG-2, DAT(the video format used in VCD, SVCD), VOB(the video format used in DVD) file to iPod video format. In addition, the Video Converter provides a powerful way to convert MPEG files to popular audio files, including MP3, AAC etc. CPU >750MHz Intel or AMD CPU. 256 MB RAM or above. Qweas is providing links to MAC-MPEG To iPod Converter 1.00.1107 as a courtesy, and makes no representations regarding MAC-MPEG To iPod Converter or any other applications or any information related thereto. Any questions, complaints or claims regarding this application MAC-MPEG To iPod Converter 1.00.1107 must be directed to the appropriate software vendor. You may click the publisher link of MAC-MPEG To iPod Converter on the top of this page to get more details about the vendor.